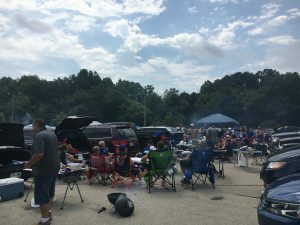 For most American sports fans, tailgating brings to mind cool fall days, with smoke wafting through the parking lot in the hours before kickoff. However, for MILWAUKEE BREWERS fans, tailgating is the public manner in which one eats, drinks, plays, and socializes before the first pitch at Miller Park, where the parking lots function as baseball BEER GARDENS in a ritual that is arguably unique in all of major league baseball. It is not entirely clear when tailgating began in Milwaukee, but it had certainly become a mainstay in the parking lots of old COUNTY STADIUM by the early 1980s. In those days, even center-fielder “Stormin” Gorman Thomas and manager George Bamberger regularly grabbed a bite to eat and chatted with tailgaters on their way into the stadium. Over the years, the parking lots surrounding the stadium became a kind of hallowed ground. This contributed to the Brewers’ decision not to construct a downtown ballpark in the late 1990s—which they feared would reduce the space available for tailgating—in favor of building MILLER PARK at the existing MENOMONEE VALLEY location. As a result, tailgating remained an important tradition at Brewers games after the move to the new stadium. Since 2007, the tailgating season officially commences with the annual “Arctic Tailgate” during winter, when individual game tickets go on sale. Fans often begin lining up in the morning, while the hardiest camp out overnight. Several weeks later, on opening day, tailgaters—many of whom will not attend the game—arrive up to four hours before the first pitch to stake out a spot for their grill. The term tailgating has become something of a misnomer, with most fans bringing tables and chairs, while larger parties can reserve catered pavilions. Brats—often grilled after being boiled in beer-flavored water—have become perhaps the most common item on the tailgater’s menu. But since the 1980s, tailgaters have also prepared ribs, tenderloin, porterhouse steaks and, more recently, fresh guacamole, and novel concoctions such as “brachos” or “Fabratas,” a tortilla with smoked bratwurst. In 2013, such culinary efforts were showcased on Adam Richman’s Fandemonium, a Travel Channel program that seeks out unique cooking and cultural traditions in American fandom. Tailgating at Brewers games (as well as at GREEN BAY PACKERS and Wisconsin Badgers football games), has become so popular that grocery stores, grill makers, and outdoor retailers in the area market food, clothing, and equipment specifically to tailgaters. Fans pass the time before the first pitch by playing a number of games, including bean bag toss and laddergolf or by playing catch with baseballs, Frisbees, or even footballs. 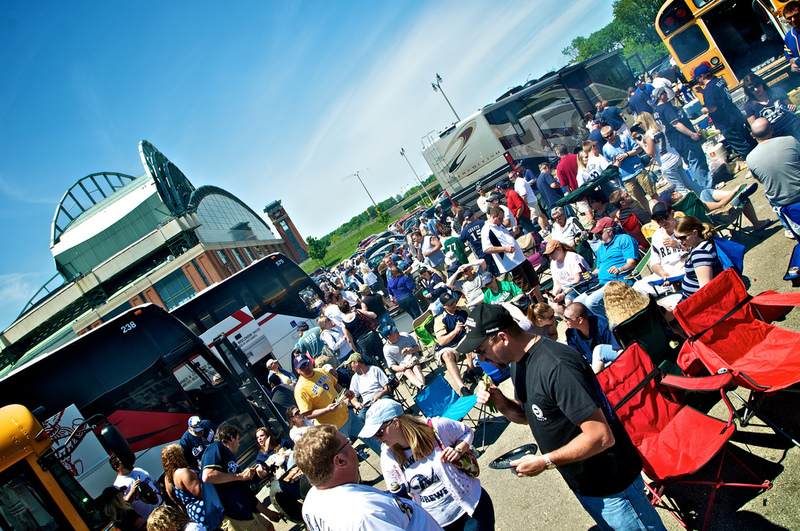 Brewers tailgaters are known to meander into the stadium during the first few innings, while some continue to eat, drink, and play in the parking lots throughout the game. As the Packers no longer play home games in Milwaukee, serious tailgating in Milwaukee ends along with the Brewer’s season. ^ Carolyn Sanford, “Fans Toast Season of Baseball, Beer” The Milwaukee Sentinel, April 16, 1981, accessed April 23, 2014, https://news.google.com/newspapers?nid=1368&dat=19810416&id=oYNRAAAAIBAJ&sjid=FxIEAAAAIBAJ&pg=7095,3471930&hl=en; Nancy J. Strohs, “Plenty Has Changed since ’57 Braves Won It All,” Milwaukee Journal Sentinel, Sept 27, 2011, accessed April 2, 2015. ^ John Sahly, “Tailgating a Tradition in Milwaukee,” MLB.com, June 22, 2006, accessed May 21, 2014. ^ Tom Haudricourt, 100 Things Brewers Fans Should Know and Do before They Die (Chicago: Triumph Books, 2013), 18; John Sahly, “Tailgating a Tradition in Milwaukee.” For an exposé of potential downtown stadium sites, see Tom Daykin and Rick Romell, “A Stadium Downtown,” The Milwaukee Sentinel, February 7, 1994, accessed May 21, 2014, http://news.google.com/newspapers?id=95NQAAAAIBAJ&sjid=BBMEAAAAIBAJ&pg=4383%2C136411. ^ Tom Haudricourt, “Brewer’s Annual ‘Arctic Tailgate’ Set for March 1,” The Milwaukee Journal Sentinel, February 6, 2014, accessed May 21, 2014; “Arctic Tailgate Has Fans Camped out to Buy Tickets,” WISN 12, February 28, 2014, accessed via YouTube May 21, 2014. Official information about the Arctic Tailgate is provided on the Brewers’ website. ^ Haudricourt, 18; “Group Tailgates,” MLB.com, last accessed September 1, 2016. ^ Andy Tarnoff, “Brewers Tailgating Guide,” OnMilwaukee.com, April 28, 2005, accessed May 20, 2014. ^ “Tailgating at Miller Park on Opening Day,” Fox 6 News, uploaded to YouTube July 11, 2013, accessed May 21, 2014; “Tailgating at Miller Park,” Fox 6 News, uploaded to Youtube July 11, 2013, accessed May 21, 2014; “Bold Brats,” Adam Richman’s Fandemonium, accessed May 21, 2014; Mary Fran Cahill, “Warming up: Tailgaters Have Their Inning First,” The Milwaukee Journal, June 15, 1988, accessed May 15, 2014, http://news.google.com/newspapers?id=NHEaAAAAIBAJ&sjid=yyoEAAAAIBAJ&pg=3039%2C6559814. ^ “Adam Richman’s Fandemonium: About the Show,” Travel Channel; Press Release, “Adam Richman’s Fandemonium set for July Miller Park Visit,” MLB.com, last accessed September 1, 2016. ^ Joe Taschler, “In Wisconsin and across the US, Tailgating Has Become Big Business,” Milwaukee Journal Sentinel, September 19, 2015. ^ Arnie Stapleton, “Fans the Winners in Milwaukee Brew-Haha,” Associated Press, May 19, 2005, Newspaper Source Plus database, accessed May 21, 2014; “Milwaukee Votes to Allow Tailgate Parties,” Associated Press, May 20, 2005, Newspaper Source Plus database, accessed May 21, 2014. ^ Don Walker, “Milwaukee Brewers to Potty-Totting Tailgaters: No BYOP This Year,” The Milwaukee Journal Sentinel, March 29, 2013, accessed May 21, 2014. ^ “Time to Take Your Tailgate up a Notch,” MLB.com, last modified July 18, 2013, accessed May 21, 2014. ^ “Other Homes of the Packers,” last modified September 5, 2011, last accessed September 1, 2016. Before holding all their home games at Lambeau Field, the Packers played at Borchert Field, State Fair Park, Marquette Stadium, and County Stadium.